~ 80 eggs of the Orange Roughy were secreted home. 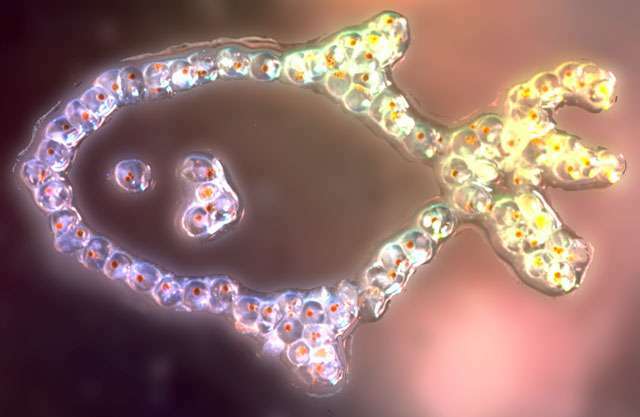 but when removed large numbers of eggs are spilled, These were arranged on a glass plate in the shape of a fish before photography. The only thing that remains is the image, the art is ephemeral. the seedyness of it all fisheggfish potentially becomes multiple fish, with fisheggs, exponential increase. the ephemeral becomes the continual are their eggs viable? can we make this viablity visable through molecular techniques. Is there a continuum from dead to life, can we bring things back, rescue them? I wish to work on this interface, between live and dead, where the organism has died, but some cells still survive, in much the same way that cells from steak can be cultured, I want to see what life remains in fish after they are caught.